Through my ambassadorship with FitApproach, I was given the opportunity to review Manitoba Harvest’s new Hemp Heart Bars. This post was sponsored by Manitoba Harvest and Fit Approach. As always opinions 100% my own. I don't know about you, but I'm picky when it comes to protein bars. So whenever I have a chance to taste test a new bar I'll jump at the chance. I've had some bad ones, but then I'm had some good ones. Recently I tested out Manitoba Harvest Hemp Heat Bars - vanilla, chocolate and apple cinnamon. I was pleasantly surprised. I had Hemp Hearts before, but I have to be in the mood. 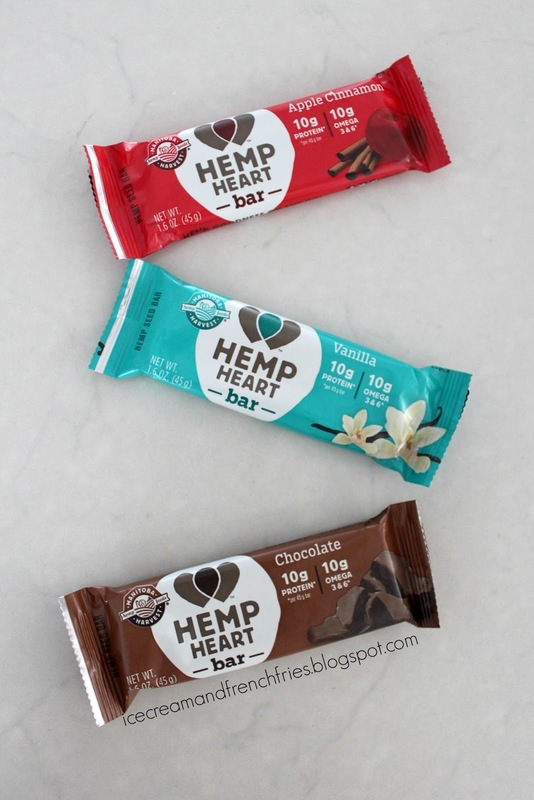 So I wan't sure what to think when I first heard about the Hemp Heart Bars. I tried the above three flavors and while they all tasted fine, Apple Cinnamon was my favorite. Hemp just pairs nicely with fruit [IMO]. This was surprise as I thought it would be my least favorite flavor. Chocolate was a fast second. I could live without the vanilla, but then I'm more a fruit, nut and chocolate kind of gal. Plus, there's no gross protein powder like taste like some bars have. Give it up for natural ingredients! About Hemp Heart Bars:Manitoba Harvest Hemp Heart bars are crafted with the goodness of hemp and other tasty ingredients too. They’ve whipped up three different delicious flavours to choose from: vanilla, chocolate and apple cinnamon. Each 45 gram bar contains 10 grams of plant-based protein and 10 grams of omegas, so whether you grab one for a pre-workout snack or nutrition on the go, these convenient bars are sure to get you through even your busiest day! Of course, I gave it a Tahoe adventure test. I don't leave home without some type or bar. You never know when you'll need a snack. For instance, the other day while I was snowboarding. I didn't want to stop for lunch, but I needed a little something. The Hemp Heart Bar kept me satisfied for a few hours. I love that you took it skiing. I LOVE taking bars with me too when I go out to snowboard or ski... :) Which one was your favorite? HAHA. I take a bar with me everywhere. You never know when you'll want a snack. Hmmm -- favorite flavor was apple cinnamon.